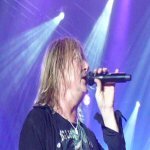 Def Leppard singer Joe Elliott was interviewed yesterday by Lisa Berigan of Big 100.3 radio and he talked about 2015 album/world tour plans. Joe talked about The Art of McCartney tribute album, how he and the band became involved, both of the songs, his connection with Paul McCartney's band, which Lep song Joe would want Paul to cover, who he'd like to work with, the 2015 tour/album and Vivian's health. Listen to the full 5 minute interview below. "Yeah, we've got a new album on the way. We're gonna be working on it all the rest of this year - most of this year and the beginning of next. So hopefully that'll be ready in time - we're pretty much lined up to tour from Spring time all the way through to the end of the year." Vivian's Health/He'll be rejoining the band? "Yeah. Vivian's just had Stem Cell surgery. He's back home. He's recovering - he's out of hospital and now he's just gotta build his immune system up. So he has to stay away from all sick people and what have you or most people in general for a little while. But it's all looking pretty positive."